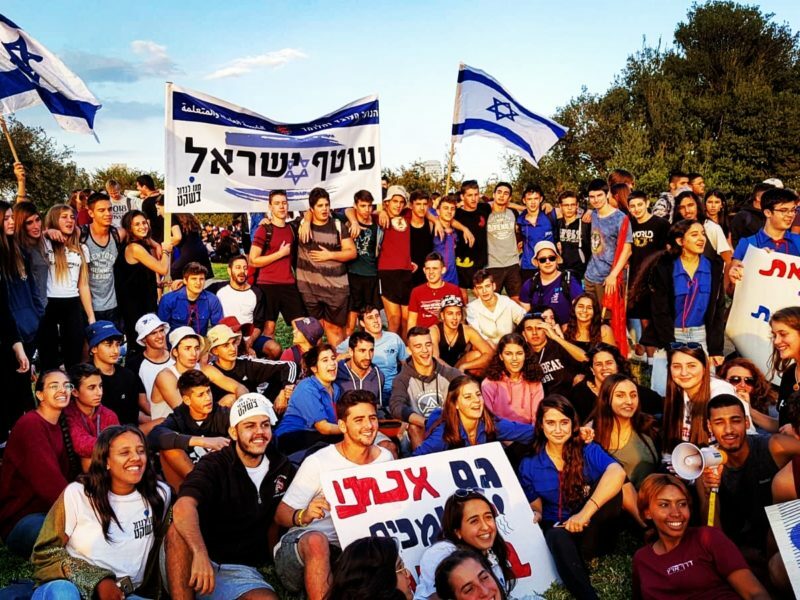 Thousands of high school students from across Israel joined together with teenagers from the Gaza Belt region as the “Black South” protest against the situation on Israel’s southern border concluded outside the Knesset in Jerusalem on Thursday. The teenagers walked 90 kilometers over five days from their homes in southern Israel in a bid to draw attention to their struggle of living and growing up under continued rocket fire, kite terrorism and incendiary balloon launches from Gaza. A rally was held in the Jerusalem Park opposite the Knesset, and as the master of ceremonies shouted, “Who here is from the Gaza Border Community?” the entire park erupted with a loud and united cheer. “We are so glad that you made it here, thank you for being here,” he said. Three boys from Kibbutz Saad, which sits just a few kilometers from the Gaza border, explained to Tazpit Press Service (TPS) that what is happening in the south is not okay. “The rockets and kites, balloons that come in, go on and on, all day, every day during Shabbat, during Jewish holidays, this past summer too,” lamented Yehuda, Yishai and Eliya. “It doesn’t stop and it’s really hard to live like this sometimes. Asked about life in on the Gaza border region, Eliya and Yehuda said that “there are long term consequences from living like this. “Children are afraid, it affects us psychologically and now with the balloons, which are supposed to represent happiness and fun, we have to be even more afraid, it’s crazy. It’s enough,” they said. Two young girls from Kibbutz Kfar Azza said that for them “war is not the answer. We don’t want a war, but at the same time this can’t continue. There has to be another option. “Two weeks ago,” said Shachar, “I was outside with my friends and there were was rocket attacks, it came from nowhere. I was very scared. I screamed and I cried. I look at my dog and I look at my family and all I see is trauma. “When will it stop?” she questioned, visibly damaged and distressed from the situation. Dalia recalled that just last week incendiary balloons landed on her school. “It’s not okay, we had to call the police and evacuate because they didn’t know if there was an explosive on it or something that can cause a fire. “All we want is quiet, all we want is peace,” she said.